This beeswax furniture polish is really quite miraculous. It’s easy to make, incredibly inexpensive, and yields beautiful results. It is guaranteed to make you fall back in love with your antique wooden furniture, wooden salad bowls, and wooden cutting boards. It restores shine and gloss, improving colour and adding an immeasurable amount of beauty. Think I’m exaggerating? I’m not. 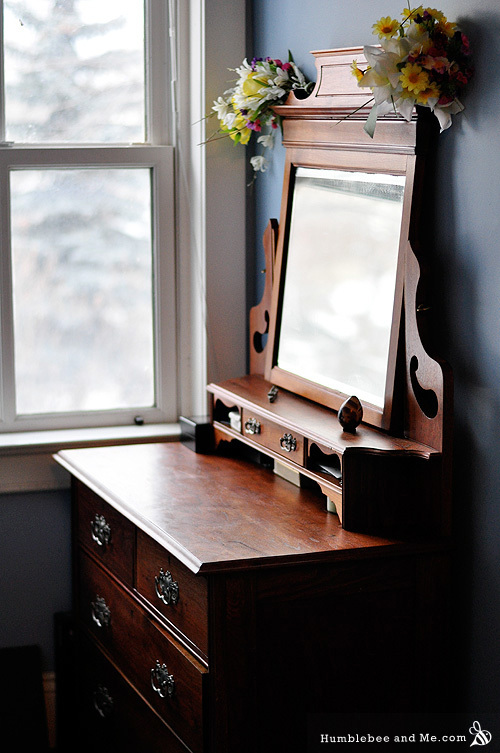 I began by buffing down my dresser. It’s a lovely piece of furniture, but years of sitting next to a window that is often open (even in rain storms… oops) has left it worse for wear. After dusting it down I buffed a thin layer of this polish into every surface, and delighted in watching the wood come back to life. Next up was our antique sewing machine and spinning wheel, and then a bureau. I’m done for now, but quite convinced I will eventually go over every wooden surface in the house before long. The polish itself is easy enough to make. I got the basic instructions and amounts from Fine Woodworking. I used a ratio of 5:1 oil to beeswax, but next time I may go with a 4:1 ratio to give me a thicker polish. For this polish, I’ll use mineral oil. I usually wouldn’t use mineral oil for much of anything as it is derived from petroleum, but in this case it has the distinct advantage of not going rancid, which is always nice. We also had some in the medicine cabinet already. You can also use long-lived plant based oils like fractionated coconut oil or jojoba, you’ll just have to watch out for rancidity (though you generally don’t have to worry about it once it’s on the furniture, which is nice). Melt together. Remove from heat and stir until cooled. It should be thick and creamy. Decant into a 100mL/3.3oz jar. 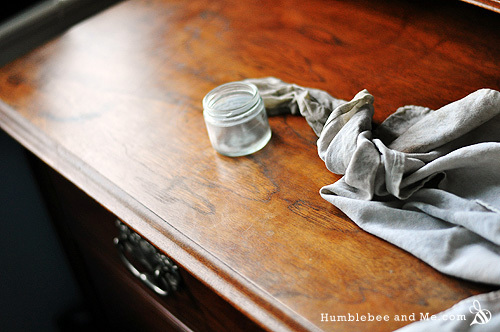 To use, buff onto a wooden surface with a clean cotton cloth. Let dry for about 15 minutes, and return to re-apply or buff off any leftovers (I like to apply a thin enough coating that this is not necessary to remove visible excess, but it is necessary to remove the stickiness so dust doesn’t stick to your furniture). Let the surface dry for a few hours before using. I have been looking for a simple recipe for this for quite some time. Thank you for posting it. Do you think you could add essential oils to this? Which ones? Steph—You definitely could, but I’m not sure why you’d want to as I doubt they’d provide much benefit to the wood and the scent will dissipate very quickly as essential oils are very volatile. 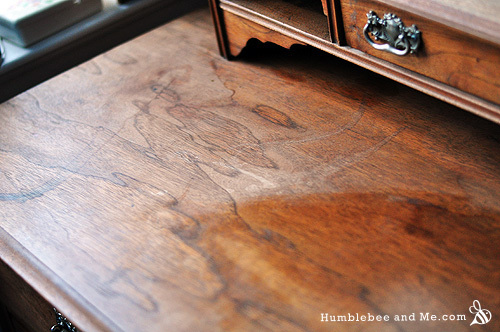 If you do decide to add something, I’d stay away from citrus oils, which could sun-bleach your furniture. 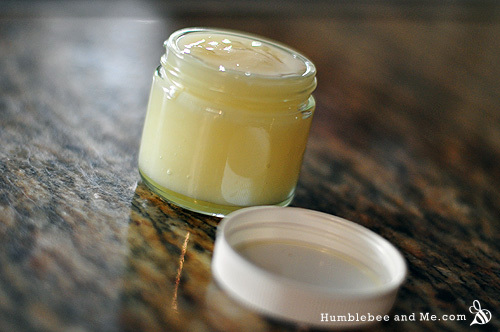 I find I love the scent of the polish as it is, since I use raw beeswax and it smells wonderfully of honey! I would like to try this,but not sure how to calculate in grams. Maybe you are not in the US. Can you translate into Tablespoons?Thanks. You’re right, I’m up in metric-loving Canada! 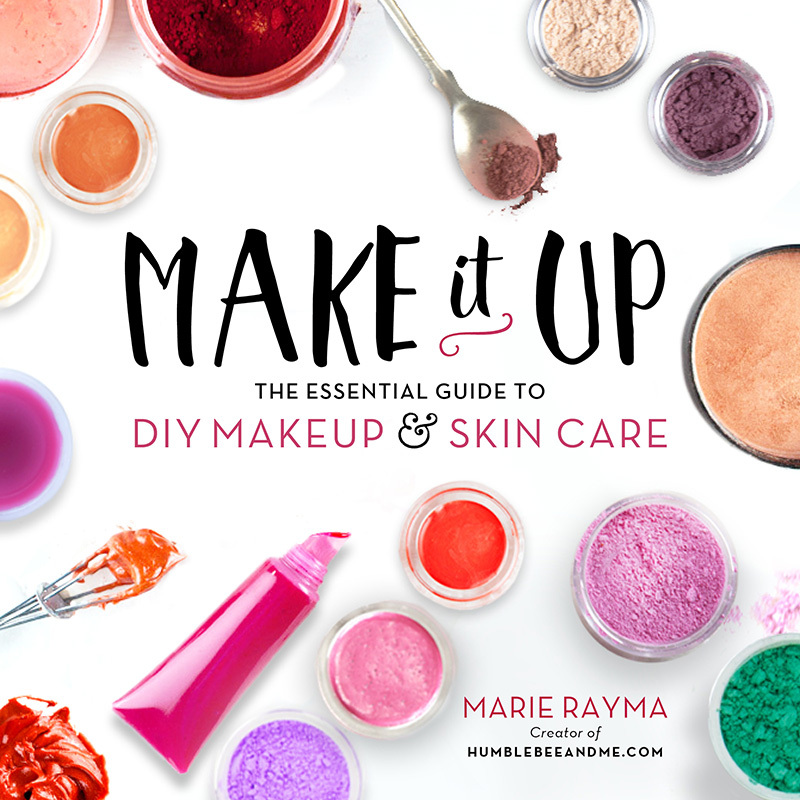 Because this recipe is basically a 5:1 ratio, you could probably do 5 tbsp mineral oil and 1 tbsp beeswax (or whichever unit you prefer). I’m still a big fan of measuring by weight, though (it’s easy and more accurate, with less clean-up! ), so you could weigh it out in oz: 1.75oz mineral oil and 1/3oz beeswax. Can’t wait to try. Thanks for such a simple recipe. Good thing I have a scale that can do grams. 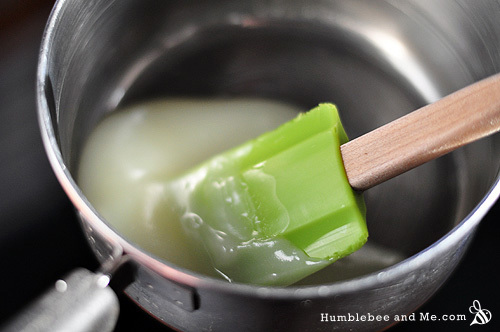 Found your lovely blog when looking for how to make beeswax polish, so many interesting things I might try. I wanted to revive a couple of small wooden tables that a friend gave me. I just used olive oil as that was in the cupboard. Cooked it up in the jar in a water bath on stove which saved having to wash a pan, used 4:1 mix. Tables look so much better. I’m so thrilled that the beeswax polish worked out for you and your tables 🙂 Thanks for stopping by and reading! i use jojoba oil in mine because it doesn’t go rancid! I think good option is to use refined coconut oil. Is cheap and very stable (doesnt go rancid as easy as other vegetable oils). i know this is an old post, but maybe you can answer this before i make up a big batch: how does one “remove the stickiness” from wood that’s been polished with this wax (as instructions say a thin layer so you don’t have to remove the excess but you do have to remove the stickiness). i just don’t know what that entails. Heat helps remove the stickiness. I would first try a cloth rinsed in hottest water your tap can produce. rinse, ring it out and apply to the wood surface. That should do it. Try multiple times. If that does not work boil some water and dip the cloth in it and wring it out, while wearing gloves, lightly wipe the wood. What you are trying to do it melt the oil and wax into the wood without transferring excess heat into the the wood. I myself use pure beeswax with no oil. I melt the wax in a garage sale 3.00 crock pot and apply small amounts and buff it in to my wood. I use this on already finished wood and on new wood as a finish. Because it has no oil, there is never any stickiness and the finish is resistant to oils in skin and solvents. It can easily be renewed with more beeswax later if needed.